Dalmations and Dog Houses " "
All Dalmations love spending time outside, as they will love to run around in the yard. Therefore, if you intend to leave your dog outside for an extended period of time, you should consider buying a dog house for your canine friend. A dog house provides your Dalmation protection from the hot sun and from other elements such as wind, rain and snow. Furthermore, a dog house keeps your dog free of ticks, mosquitoes and other irritating insects that could infect your dog. It’s also a great place for your dog to relax, and is a part of the yard he can call his own. A raised floor – This will keep your dog warm and dry. It will also allow for the right amount of ventilation, so your dog can have fresh air without losing a comfortable temperature. Interchangeable windows androof – This is if you live in a climate that is ever changing. That way you can change your Dalmatian’s house to suit the temperature of each element. Self-closing door – This feature is particularly important if you live in an area that is prone to black flies and mosquitoes. This type of house usually features a flap that will automatically close as soon as the dog goes inside. Size – The dog house must be large enough to allow your Dalmatian to stand up and turn around. Regardless of what type of dog house you get for your Dalmatian, always remember that you shouldn’t leave your dog outside all of the time, or at night time. It is unfair to leave your dog by his lonesome all the time for long periods. Your dog is happiest when he is with you. Therefore, if you are purchasing a Dalmatian with the intention of leaving the dog constantly on his own, you should reconsider owning a dog. 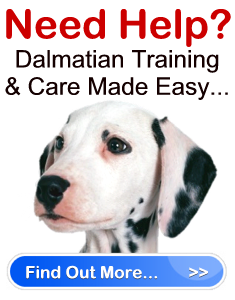 Furthermore, Dalmations have sensitive skin, and do not do well in extreme elemental weather. This is another reason why you shouldn’t leave the dog out all the time. Nevertheless, a dog house is a great idea for your Dalmation. He will enjoy having this refuge when he is outside, even when you are out with him. After all, a happy dog makes a great dog.